Making the most of outdoor space in an urban environment is very important. With land at a premium, more people are converting their flat roof space to a garden retreat. How do you get to it though? 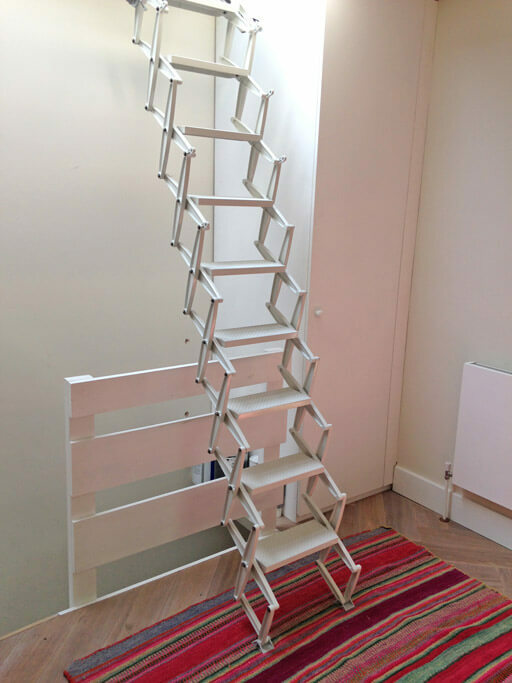 A full size staircase takes up a lot of room and can be quite expensive, especially for occasional use. Doone Lambert had exactly that problem at her Hammersmith, London apartment. 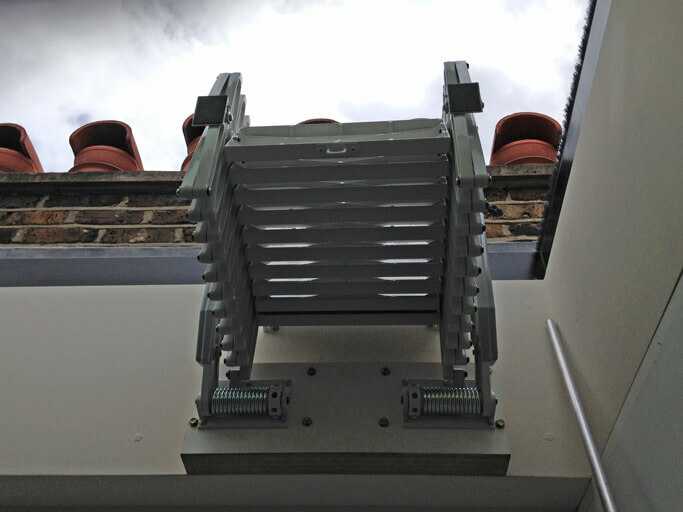 Doone chose a solution that saved both space and money, while still providing safe and convenient access to the flat roof. Doone Lambert owns an apartment in Hammersmith, London. Private outdoor space in London is limited, so making the most of the flat roof to provide a small garden retreat was a great idea. There was already a large rooflight installed above the staircase, which flood the stairwell and landing with lots of natural light. The rooflight also slid open to allow access to the roof. However, the only way to access it was positioning a ladder beneath it. This proved quite dangerous. 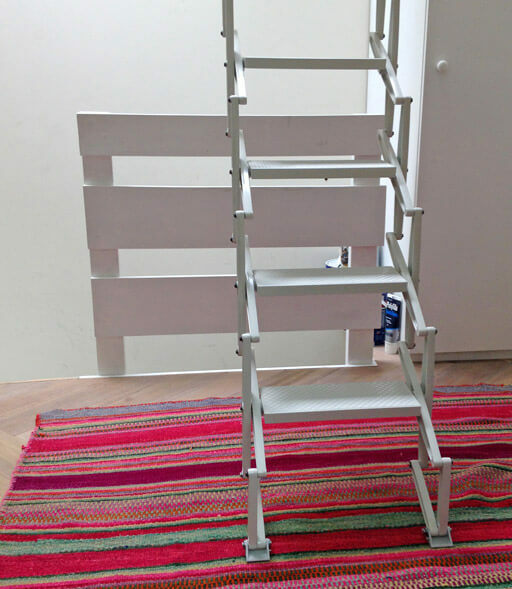 In addition, there was the issue of where to put the ladder when it was not being used. 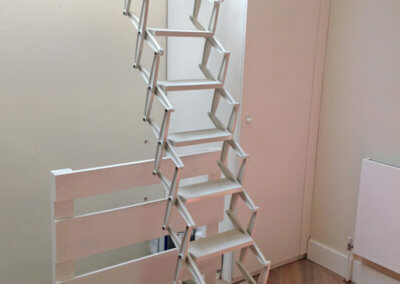 Doone Lambert found Premier Loft Ladders while doing an internet search. 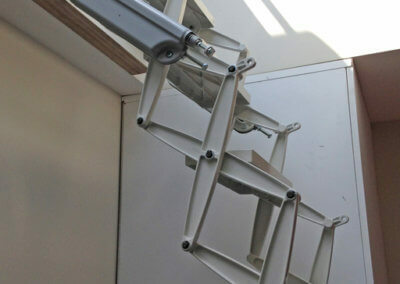 Already having one quotation from another loft ladder supplier, she was looking for a 2nd quotation for consideration. 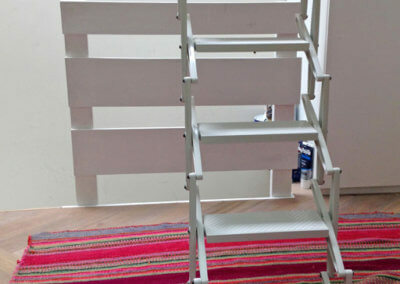 Based upon an initial telephone conversation, an Elite loft ladder was recommended. 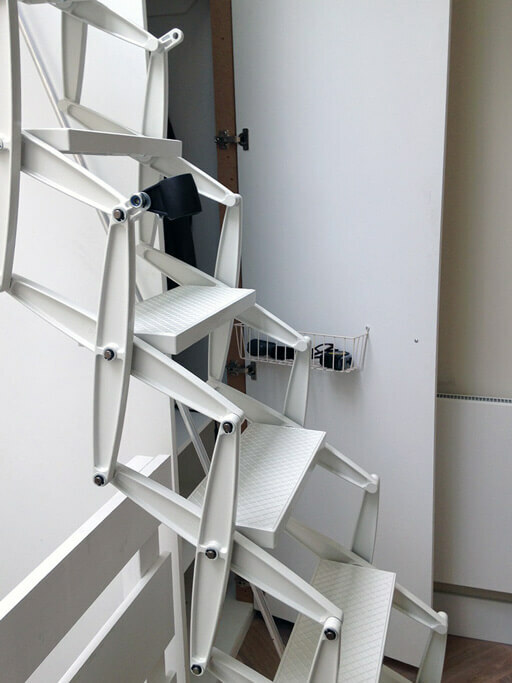 The Elite is a compact, space-saving loft ladder. 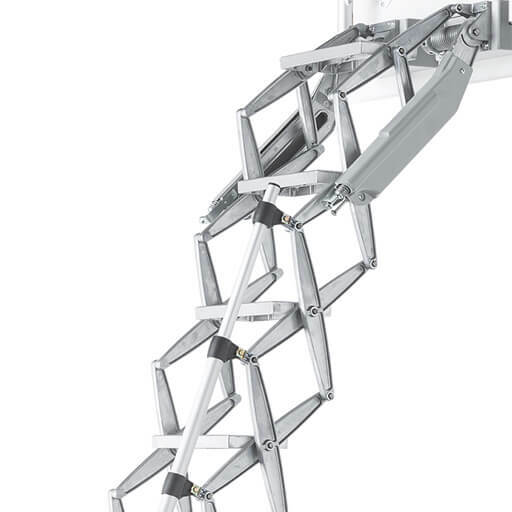 Furthermore, the Elite features deep treads (350mm wide by 140mm deep) offering a safe and comfortable footing for anyone using the ladder. A site visit was organised to fully assess the requirements. Of concern was the balustrade that the Elite had to clear when open, so detailed measurements were taken and a technical drawing prepared specific to the application. 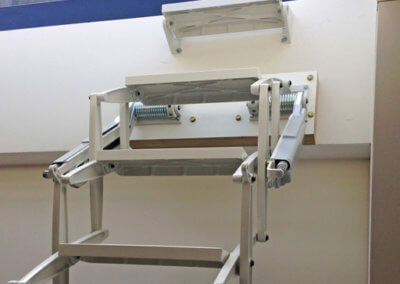 Above: The Elite loft ladder features wide and deep treads for comfort and safety. 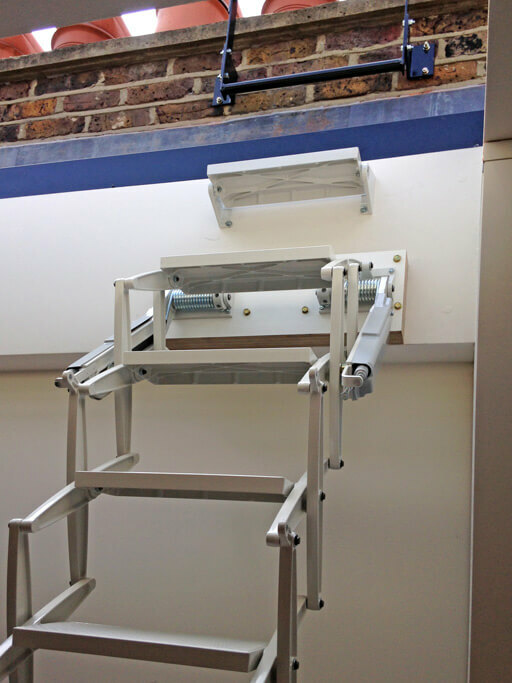 Above: Elite loft ladder for access to rooflight. Grey-white powder coat finish to match the decor. Because of the prominent position of the Elite above the stairway, and the decor of the room, a powder coat finish was requested. A ‘grey-white’ (RAL 9002) colour was chosen, which provided a near perfect match to the wall colour. 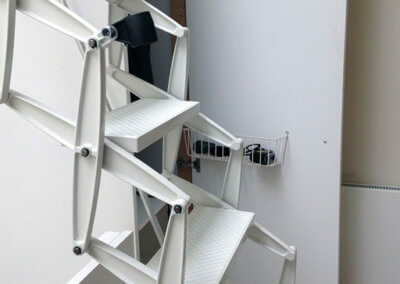 This durable powder coat finish was applied to the metal structure of the loft ladder. Also, it was applied to the extra tread that was fitted to the wall above the Elite, which made access through the rooflight much easier. 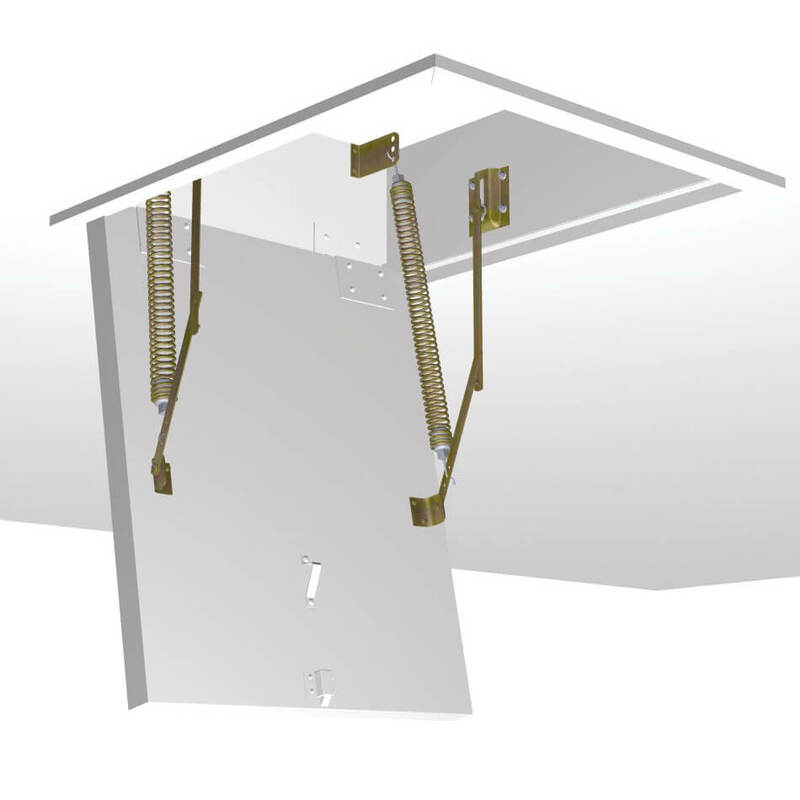 The Elite was installed by Right Height Ltd, who have supported Premier Loft Ladders’ customers with installation on many occasions. 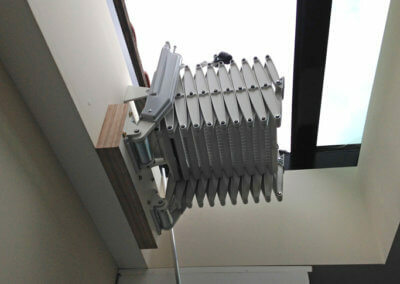 Doone was very complementary about the quality of the installation by Right Height. In particular, their approach to solving difficult problems. This included, the installation of a custom-built roof handrail. 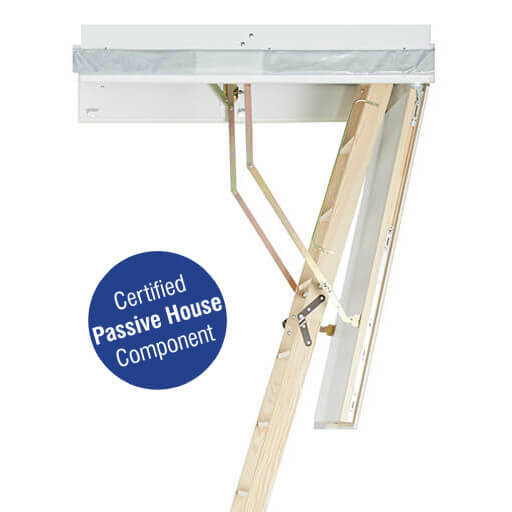 The Elite loft ladder provides safe and convenient access to the rooflight. 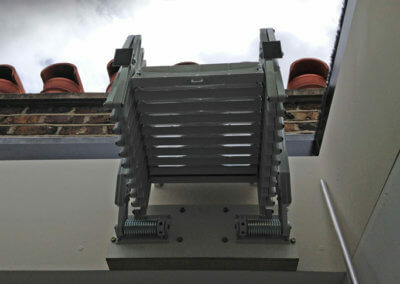 The compact concertina ladder means that the Elite can fit snugly into the space beneath the skylight when not in use. 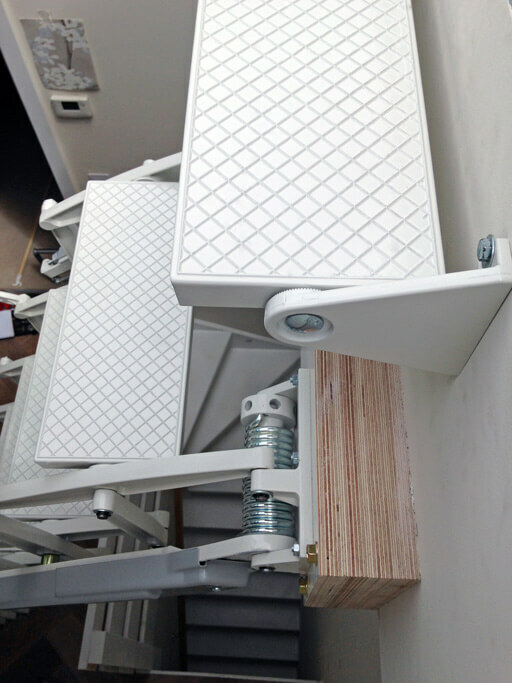 When access to the flat roof is needed, the Elite gently extends to the floor (requiring less than 3 kg operating load to open and close). 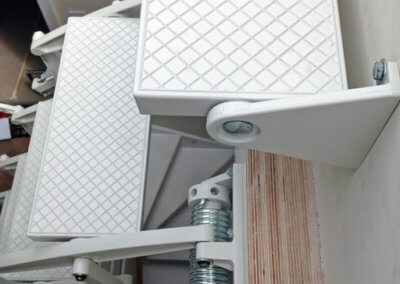 The large treads then allow the occupant to easily climb the ladder and pass through the rooflight. 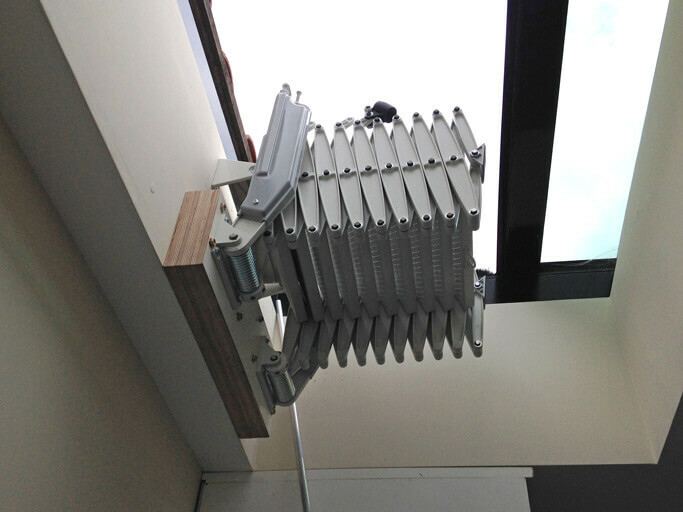 Doone was very pleased with the Elite and the quality of the installation; all of which more than met expectations. 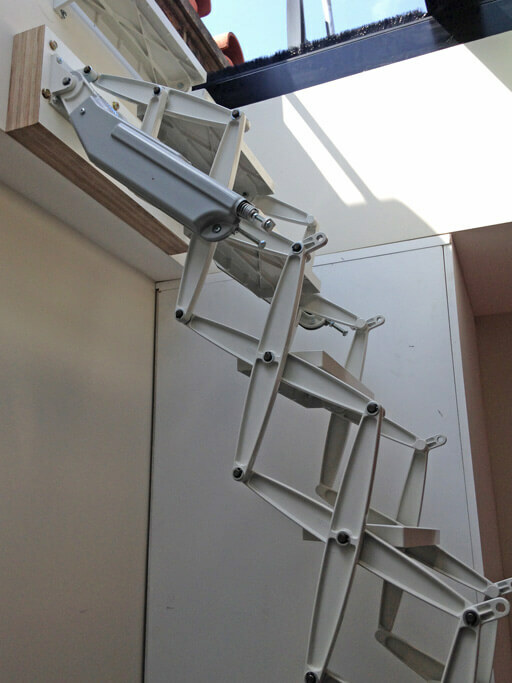 Above: Elite concertina loft ladder for access to skylight over staircase.